In 1-quart saucepan, mix 1/3 cup sugar, the cornstarch and orange juice until smooth; stir in blueberries. Heat to boiling over medium heat, stirring often. Boil 3 minutes, stirring often. Spray jelly roll pan, 15 1/2x10 1/2x1 inch, with cooking spray. Cut lengthwise slit in side of each bread slice, cutting to but not through other edge. Spread marmalade inside slit. Place in pan. In large bowl, beat eggs, half-and-half, 1/4 cup sugar, the nutmeg and vanilla until well blended. Pour over bread; turn slices carefully to coat. Cover and refrigerate 8 hours or overnight. Heat oven to 425°F. Uncover French toast. Drizzle with melted margarine. Bake 20 to 25 minutes or until golden brown. 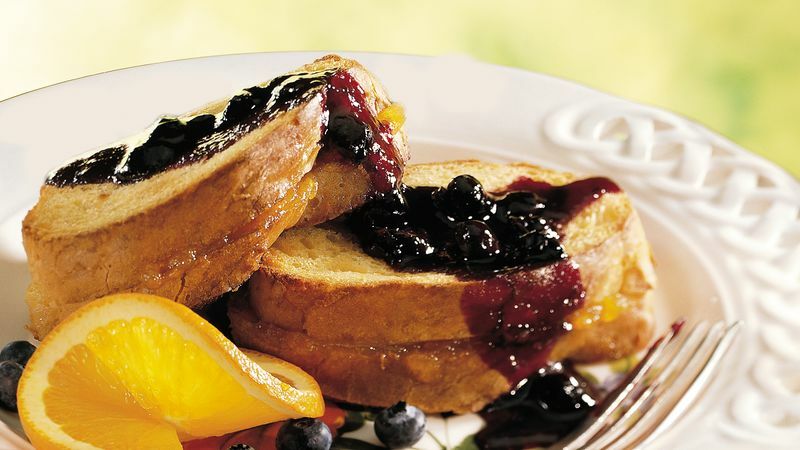 Serve with Blueberry-Orange Syrup. Use day-old bread to make the French toast. Prepare the syrup up to 1 day ahead of time, and store it covered in the refrigerator.